French President Emmanuel Macron can expect a warm welcome from Donald Trump - and, most likely, some glitz and pomp - when he arrives in Washington on April 23 for a two-day summit. It is the Trump administration's first state visit of a foreign leader. Macron's rise to power was remarkable. After years of sluggish growth and persistently high unemployment, he easily passed controversial reforms to France's labor market. Among other changes, the new rules make it easier for companies to hire and fire employees. A government plan to prevent new hires at France's state-owned national railway from being awarded the same generous benefits as current workers - such as early retirement, extra vacation time and lifelong employment guarantee - has been met with three months of strikes. Railworkers also oppose Macron's decision to end the railway's monopoly, opening it up to foreign competition by 2020, in line with European Union rules. Union opposition is a significant first political test for Macron. It comes at a critical time: A year into his presidency, Macron's approval rate is 40 percent. It was 64 percent just after his election. Macron enjoyed early support from German Chancellor Angela Merkel, who has emerged in recent years as the reluctant leader of Europe. But Germany's new coalition government disagrees with parts of Macron's plans to create a larger - and more flexible - European Monetary Fund that would offer countries bailouts to prevent a repeat of Europe's continuing debt crisis. France's strikes mark a particularly crucial juncture for Macron. If he faces down France's powerful unions to implement his labor reforms, he will have achieved something none of his predecessors could do. And that, I expect, is something Donald Trump could respect. Trump is rolling out the red carpet for Macron's visit: a private dinner at George Washington's home, Mount Vernon, and a joint address to Congress. Macron and Trump agree on several important foreign policy issues. France joined recent U.S.-led air strikes against Syria's chemical laboratories and both countries continue to cooperate well on counterterrorism. The U.S. administration temporarily exempted the European Union from its major tariffs on steel and aluminum imports announced last month, but this exemption is set to expire on May 1. Trump has called on the European bloc to rectify what he deems "unfair" trade practices. Macron will also try to convince Trump to stick with the 2015 Iran nuclear deal President Barack Obama signed along with France, the United Kingdom, Germany, Russia and China. Trump has said the agreement has " disastrous flaws" and gave Congress until May 18 to "fix" them. Otherwise, he has said, he will withdraw the U.S. from the deal. The French president is a skilled diplomat, but still I find the odds of a breakthrough over trade and Iran unpromising. Donald Trump has historically paid little heed to his foreign counterparts' input on global issues like climate change and NATO. Reports suggest that Macron himself is not very optimistic. He probably hopes simply to avoid further damaging transatlantic relations by entering in a prolonged dispute on either subject - or, worse, on both. A trade war would be very costly for the U.S. and Europe, which are economically interdependent. And if Trump withdraws from the Iran deal, it would both provoke and humiliate the United States' European partners who spent more than a decade crafting this agreement. The summit could not have higher stakes for Macron. 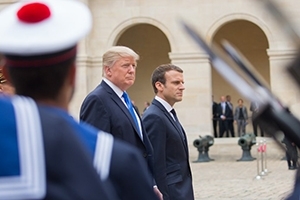 He must realize that the fate of the more than a half-century-old Western alliance might rest on his ability to sway Donald Trump in Europe's direction - which will be no easy task. This article was originally published on The Conversation by Garret Martin. Read the original article.